There are plenty of rich neighborhoods and towns all around the United States of America, but The Hamptons are on another level. Located on the East End of Long Island, the little villages that make up this very special part of New York State are known for their astonishing real estate prices and wealthy residents. The Hamptons also happen to be one of the most beloved summer resort areas in all of North America, well-known all around the world for their luxury resorts, exclusive clubs, and aforementioned upscale residences. The Hamptons are made up of the two towns of Southampton and East Hampton, with over a dozen little villages and hamlets making up these two towns. Most of the villages are quite quiet and sleepy for large parts of the year but really spring to life when the summer months come along. The area may have some of the highest average house prices anywhere in the United States, but it attracts a vast and varied crowd, from A-list celebs to casual New Yorkers and international tourists. In short, everyone can feel welcome at The Hamptons and the beaches here are some of the best in America, so they’re definitely worthy of a visit. Famously popular with the rich and wealthy, The Hamptons can be enjoyed by anyone, with a long stretch of beautiful public beaches just waiting to be enjoyed. Many New Yorkers and Long Island residents head out to these beaches when the sun starts to shine, so even if you don't happen to own one of the million dollar mansions dotted along the coastline, you can still enjoy these breathtaking beaches at any time of year. Read on to learn all about the best beaches in The Hamptons. As the name suggests, Main Beach is the primary beach in East Hampton. This is where you'll see the biggest crowds and most action all through the year. Lifeguards are on duty at this beach, helping to guarantee the safety of all visitors, and the beach is conveniently located just off Ocean Avenue. Daily parking costs $30 here and the local amenities include clean restrooms and a snack bar offering a range of refreshments. In terms of the actual experience at this beach, you can expect to enjoy soft, powdery sands and some pretty impressive waves that hit the shore in a series of frothy splashes. Swimming can be a lot of fun here, but it's also a nice spot to bring the kids and make some sandcastles or play beach games. Crowds gather at weekends and in the summer, but if you visit on a less busy day you might be able to have the place almost all to yourself. Situated on Atlantic Avenue in Amagansett, Atlantic Avenue Beach offers a huge open space for every kind of beach activity. Whether you're looking to play beach games with your pals or sit on the sand with a good book, you're guaranteed to have a great time at Atlantic Avenue Beach. There are lots of local amenities too including concessions, restrooms, restaurants, rentals, and more. There's even a local nightlife spot running parties, movie nights, and live entertainment, so the fun never needs to stop at this Hamptons beach. Consistently classed as one of the prettiest beaches not just in The Hamptons, but in all of North America, Coopers Beach is located on Meadow Lane in Southampton. It stands out for its exceptionally soft, quartz-laden sands and towering dunes. As with many of The Hamptons' best beaches, you'll be able to glimpse some of the area's deluxe mansions and residences dotted around the local landscapes, but the sand and sea are the real stars here. Whether you're strolling along or dipping your toes in the water, you'll find a lot to love about Coopers Beach. Local amenities include nearby inns, restrooms, showers, concessions, and beach equipment rentals. The main lot comes with a sizeable parking fee, but if you're willing to walk, you can park a little further away for free or use public transportation like shuttles or the Long Island railroad. Just off Two Mile Hollow Road, Two Mile Hollow Beach is another of East Hampton's prettiest beaches. Main Beach is a great option in this area, but Two Mile Hollow Beach is calmer and quieter with fewer families and less noise on a typical day than its bigger neighbor. The local streets are home to some interesting landmarks including a 19th century library and some upscale stores, and there are some fine dining options just a short walk off the sand as well. Lots of celebrities have been spotted walking along this Hamptons beach in the past and you can follow in those famous footsteps for yourself by heading on down to Two Mile Hollow Beach. 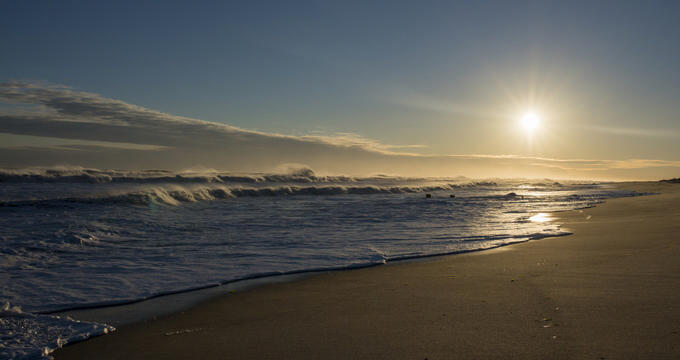 Stretching out across the two barrier islands of Westhampton Island and Fire Island, Cupsogue Beach County Park is one of the best beaches in The Hamptons, especially for nature lovers. One of the best things to do at this Westhampton beach is to stroll along the sand and keep an eye out to try and spot some seals and sea birds. Bass fishing is also popular at this beach and there are some breathtaking views to be admired in every direction, so don't forget to bring your camera and snap some photos. Amenities at this beach include concessions, showers, and changing rooms.